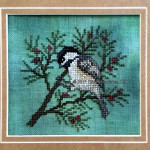 Crossed Wing Colletion, Chickadee No2. 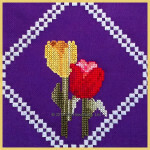 This is my first counted cross stitch project. 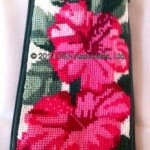 Stitched decades ago and never used as a glass case. 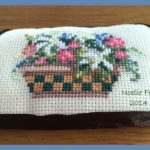 Once finished, I quickly realized this would make a great way to care my unused stitching needles. I wanted a cute snow person to be the greeter on our front door. 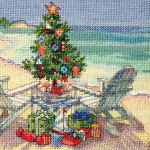 I found this cross stitched pattern on StoneyCreek.com. 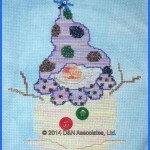 The pattern is Carolyn Manning Designs – Snowball of the Month – May. 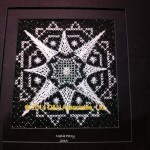 I utilized a bit of a Northern Pine Design called Snowflake to create this white and silver piece. 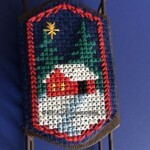 It is about 4.5 inches square, shown here in a coal black double mat. 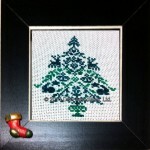 This is the design I embroidered for my 2013 Christmas cards. 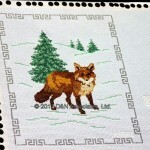 The Fox is a counted cross stitch design from the Cross Stitcher Club website. I will measure it, but I believe the worked area is about 100 x 123 count.